How do I hide the left navigation sidebar? There is a new left navigation sidebar. I prefer using the space for reading questions. How do I hide it? The instructions above only work if you're signed into an account. You can still get to the navigation items by clicking the menu icon on the top left. 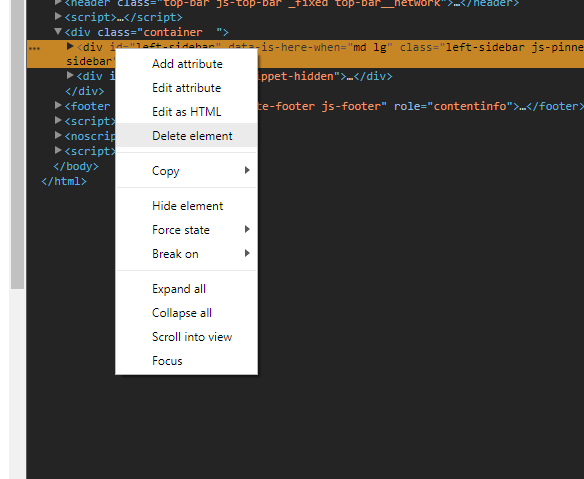 Although the proper way of disabling it has been already explained in the previous answers, I was impressed by the Stylish plugin for Chrome which provides, among others, the auto removal of Stack Overflow left navigation bar! You just install it and it will do the right thing. 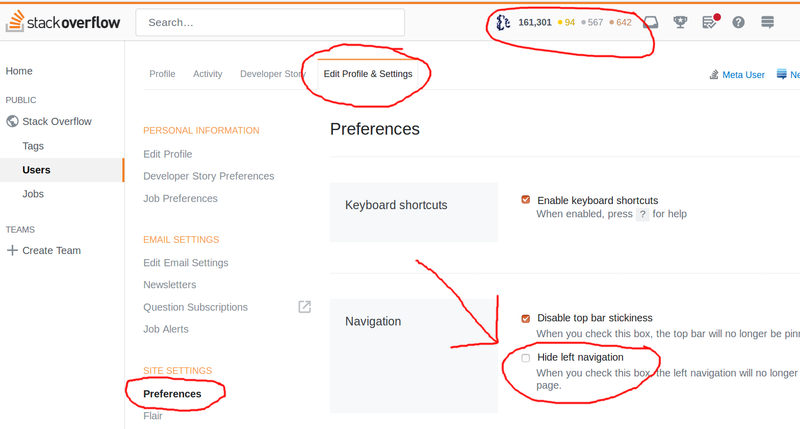 Although not super involved on Stack Exchange environment, what impresses me is how big the backlash on this feature went, that someone even made a specific style for such plugin to remove the left navigation bar. It should make Stack Exchange people think about keeping such features even when people go out of their ways to remove it. In addition to hiding the left navigation by changing user preferences, I wanted to remove the sidebar (on the right of the page), and make the main content take up the the entire width of the browser window. On Chrome, I achieved this by using the AdGuard ad blocking extension. Here are the steps you can follow to replicate this, once you've installed AdGuard on Chrome. The first user filter removes the sidebar div on the right of the page. And the second user filter runs some JS code that sets the size of the main content to the full width of your browser. Note: Will appear again if you change route, so just don't. It works for everyone. Unlike the “Preferences” solution which only works for registered and logged-in users. Not the answer you're looking for? Browse other questions tagged support faq-proposed left-navigation . New layout is taking too much space. Is there option to minimize the left side bar? Can the left navbar be made collapsible? 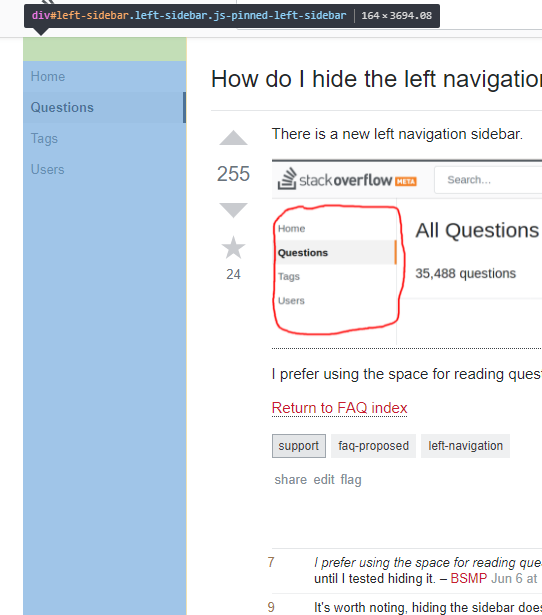 Is there way to switch to the old UI of Stack Overflow? How do I make the central question panel larger? How do I make a good edit? How do I amend a Documentation edit (or an edit on an ordinary question or answer)? Can we hide the new line on the left of the page? How do I present a proposal for change or write a feature request for Stack Overflow?